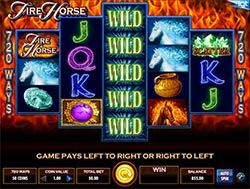 Take a trip on the wild side with the beautiful mares in the awesome Fire Horse slot machine from IGT, available free here at Slotorama. This 5-reel slot comes with the MultiWay Xtra giving you 720 ways to win on a 3-4-5-4-3 diamond slot configuration. The slot is set against a fiery background, as it should be with the name Fire Horse. The horses on the reels are either a fiery red/orange or a steel blue color with fiery manes out of the back of their necks. That’s only the start of the great graphics in this game however. Other graphics on the symbols include the game’s logo acting as the highest paying symbol, a clay pot, a horse coin, a wild symbol, a scatter symbol and card symbols jack, queen and king. Multiway Xtra 720 – With IGT’s MultiWay Xtra 720, you’ll have more ways to win than in traditional line slots. In fact, you’ll have 720 ways to win and you can win from both left to right and right to left! Free Spins – Land 5 of the purple jeweled bonus symbols on consecutive reels in normal play will pay 50 and win 8 free spins! You can also re-trigger these free spins during the free spins round by landing 5 of the blue jeweled bonus symbols on 5 consecutive reels. Wild Symbol – The Wild symbol is very simple to spot as it just reads WILD on it. It only appears on reels 2, 3 and 4 and will substitute for most symbols except the scatter and free spins bonus symbols, to complete winning combinations when possible. Scatter Pays – The Green jagged jewels is the scatter symbol and landing 3, 4 or 5 of them anywhere on the reels will earn you 2x, 10x or 50x your total bet!